Disney Hyperion, 2017. 437 pages. 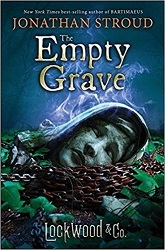 I finished The Empty Grave today, and with it the entire Lockwood & Co. series - and Yes! The series ends well. I can now officially say that from start to finish, this is one of the best children's book series ever. These books make good family reading, since adults will enjoy them every bit as much. Children need to be old enough to be able to not be afraid of all the murderous ghosts (and murderous people). If your child doesn't mind some severe spookiness, I highly recommend this series. This series deals with an alternate reality England where there's a "Problem" with ghosts roaming the countryside and haunting buildings and places where they died. These aren't friendly ghosts - if they touch you, you'll die. And only children can see them. Lucy, Lockwood, George, and Holly still have their independent agency for dealing with ghosts - but powerful forces are ready to put them out of business - or perhaps simply kill them. In this final installment, all the threads come together. Can the smallest agency in London expose what's at the root of the Problem? Or will they be silenced? We're told at the beginning of this book that Lucy survives. But will any of her friends survive with her? I really mustn't say any more about the plot. Yes, this is a series you should read from the beginning - It's brilliantly crafted, with important pieces revealed at just the right time. In this book, it all comes together in a satisfying, and very suspenseful, way. Jonathan Stroud's Bartimaeus series is brilliant - but Lockwood & Co. goes far beyond it. You come to care about all the characters deeply (even George!) and to understand the complex situation and all that's at stake. This series is magnificent! Read it!